Google is battling inaccurate click through measures that artificially inflate costs with new guidelines for what constitutes a click. According to an AdWords blog post, 50 percent of touchscreen clicks are accidental. To expand on their efforts to reduce accidental clicks, Google has instituted three main measures to prevent advertisers from paying for accidental clicks. First, Google will include a buffer zone around images, since the company has identified the edges of images as an area prone to accidental clicks. 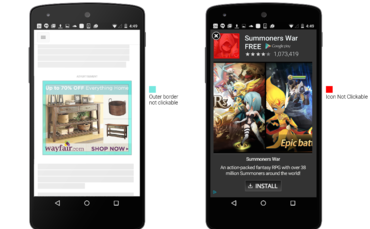 AdWords will also regulate in-app clicks by limiting them to the call-to-action button in in-app interstitial ads. Finally, the company will introduce a delay that allows the ad to fully download before it becomes clickable. This is not the first time Google AdWords has made efforts to reduce clumsy clicks. In 2012, the company launched “confirmed clicks” for banner ads that asked users to verify their intention to click on an ad.